A lot of things, none of which were expected, changed for rapper/singer Quan since we first heard him on Nas’s 2004 Just A Moment. Many were excited and expected to hear if the man Nas touted as the “Future Of Hip-Hop” lived up to the praise on his then titled, Until My Death, Atlantic Records debut album. Five years later, and the validity of Nas’ claim still hasn’t been completely justified. Instead of acclaim and accolades the details of the past few years of Quan’s life have included label disputes, a falling out with his mentor Nas, and enough family tragedies to break the average man. 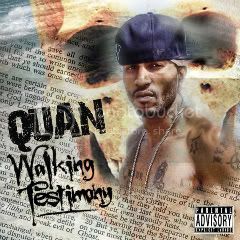 On his latest release, Walking Testimony, a prelude to his upcoming untitled album, Quan laments about both the allure and the consequences of street life and discusses how his past conspired to create the man he is today. We enter his life’s story with him receiving wise words from his mother on the track Streetz Keep Callin. She asks him to consider the future he predicts for himself, reminding him that when negatives are expected they often come to reality. The uncomplicated beat courtesy of Sha Money XL couples up well with the catchy hook. Immediately you recognize that Quan still has the ability to give realistic depictions of the street. The hopelessness that lies in the truth of the lyrics will speak to anyone who has ever had to live the life. The laid-back track, Getting Money makes you feel like you should be smoking something, and is bound to be a fan favorite because of the Nas feature, but don’t get too excited though Nas’ participation is limited to the hook. On G-Call Quan defines those who have “G” status, the qualifications, which more or less describes those who can be classified as “hood” are not limited to the males, females get a few lines too, so if you don’t hear yourself described, it’s because you don’t belong. The idea behind the song has been done many times before, and seems very Yung Joc-ish (that’s not a compliment), but you’d be lying if the you said the Needlez production doesn’t get you hype and make you chant along anyway. Sunny days don’t come his way until Just Believe where he speaks of how he was able to prevail despite the detractors. The chorus which proclaims that “Dreams come true,” is a nice switch up from the previous tracks, and Quan gives the listeners reason to believe, using his life as an example. For obvious reasons, it is kind of hard to hate on a song with an uplifting message. The bluesy track that precedes Just Believe, titled I’m Good may seem like the beginning of the good times, and the intent of the song was really to be uplifting, but on it his reflections and vivid descriptions of the events he made it through , overshadow the good that resulted. With noticeably less clarity he also briefly discusses the turn in his relationship with Ill Will Records. Everyone can relate to having bad days or bad years, and telling other people “they are good” because it could be worse, and because they still hold on to the belief that the bad can only be temporary, and that’s why this is the best track on the album. Quan’s storytelling skills will rightfully earn the respect of many. But, some of the tracks will sound familiar to the one before it, and the album is “hood-themed”, so if you are looking for anything beyond stories of the street life and the stuggle, look elsewhere.